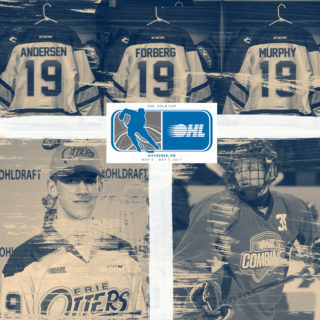 The Erie Otters of the Ontario Hockey League have announced that they have acquired center Dane Fox, defenseman Troy Donnay, Sudbury’s second round pick in the 2012 OHL Priority Selection and London’s second round pick in the 2016 OHL Priority Selection in exchange for center Greg McKegg, goaltender Tyson Teichmann and defenseman Brett Cook. Fox, born on October 13, 1993 in Thamesville, Ontario, has 32 points in 34 games with the Knights this season. 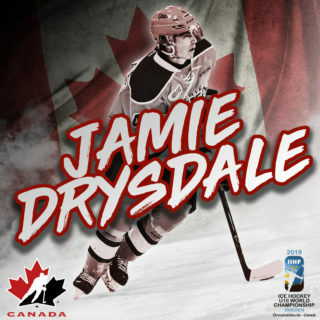 He was ranked 14th among OHL skaters in the preliminary rankings by Central Scouting for the 2012 NHL Entry Draft. Donnay, born on February 18, 1994 in Fenton, Michigan, is a towering defenseman who stands 6-foot-7. He has suited up in 48 regular season games for the Knights, tallying four assists. McKegg returns to near his hometown of St. Thomas after an illustrious career with the Otters. 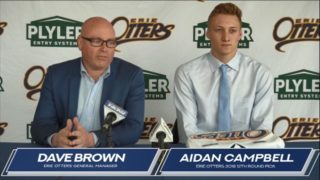 The Toronto Maple Leafs prospect leaves Erie as the organization’s third highest goal scorer with 106 and fourth highest point getter with 229. Teichmann, who was acquired by the Otters in the summer from the Belleville Bulls, won a gold medal with Team Canada at the 2010 Memorial of Ivan Hlinka. Cook, an overage defenseman, played in 217 regular season games for the Otters and tallied 17 goals and 44 assists. 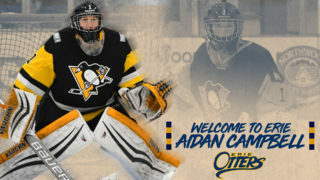 He was an invite to Toronto Maple Leafs rookie camp last summer. 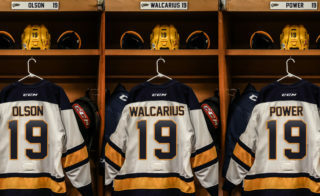 The Otters return to Tullio Arena when they take on the Sarnia Sting Friday night at 7:00 p.m. Saturday night, the Kitchener Rangers come into town for Guns and Hoses Night. See two games for the price of one when Erie police, fire and EMT workers battle it out at 3:30 p.m. to benefit Shriners Hospital for Children. For tickets, call 814-452-4857 or go online to ottershockey.com.